What’s Up with Climate Change? 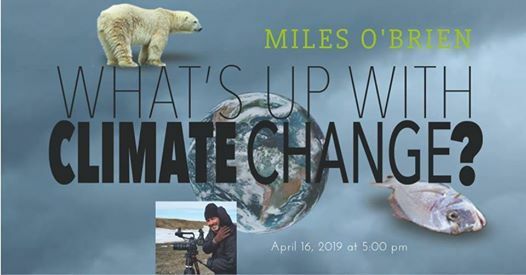 Join us for what promises to be a fascinating and inspirational presentation from veteran journalist Miles O’Brien. Through his independent media production company, O’Brien has created content for PBS NewsHour, Nova, Frontline, CNN, the National Science Foundation, plus numerous other credits. His award-winning journalism has earned him six Emmys, a Peabody and a DuPont for his coverage of Hurricane Katrina. He lost his arm after being struck by a heavy equipment case while on assignment in 2014—coming back to compete in running marathons and ultra-long-distance bike races, and returning to the skies as an aviator. Advance tickets $250 pesos online at https://i3sma.org/tickets/ or at Tienda Tesoros in the Biblioteca. $300 pesos at the door on the day of the event. Presentation and Q&A will be followed by an informal reception with complimentary botanas and beverages available for purchase. Join us in greeting distinguished thought leaders—from the sciences and humanities alike—as they share with us the latest advances in their respective fields, through a year-round calendar of presentations and related event, right here in San Miguel de Allende. What will color our future, enhance our knowledge, deepen our grasp of what it means to be human? From the clockwork of the cosmos to the inner workings of the mind, exponential advances in our understanding of the world—and ourselves—pose a constant challenge to “conventional wisdom.” i3 rises to this challenge through in-person conversation with some of the leading thinkers of our time.